The Arundel Modern Executive Desk is designed to make a bold statement in your office, with elegant detailing in the design and striking materials blended into the construction. 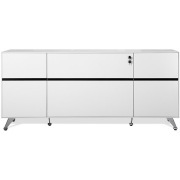 Chromed steel legs are accented by the large rounded top (71"w 35.5"d) and privacy panel. The cabinet is a generous 63-inches long and 22.5-inches deep, and offers two vented one-door cabinets perfect for storing your larger office items, or even a CPU. A pencil drawer and filing drawer at the cabinet's end complete the piece. Boasting high-end materials, Arundel is your modern solution for the modern professional. 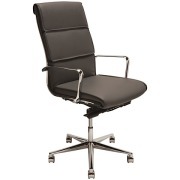 Searching for a piece of office furniture that makes a statement? 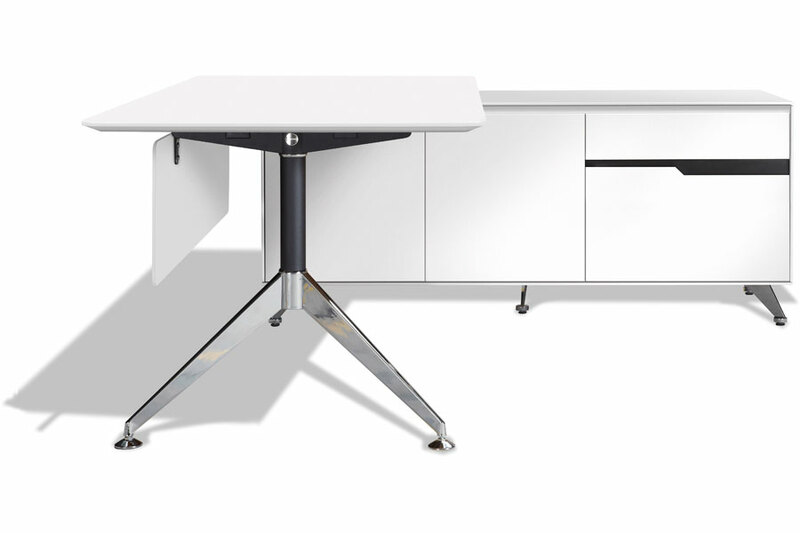 Arundel is our modern executive desk solution - the perfect blend of functionality and attractive design. This long-time favorite of business execs is always an excellent choice, whether you're shopping for your business or your home office. An executive desk is a status symbol. If you're using it in the workplace, it might be the first impression someone gets from you as a company executive. In your home, even if you don't have a designated 'office area,' an executive desk can turn any ordinary room into a productive workspace! 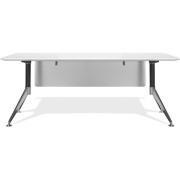 The Arundel Executive Desk is the ultimate solution for your office. Whether you want it in your home or at work, it'll fit in equally well. It's a stunning statement piece that demands respect and grabs the attention of anyone who sees it. 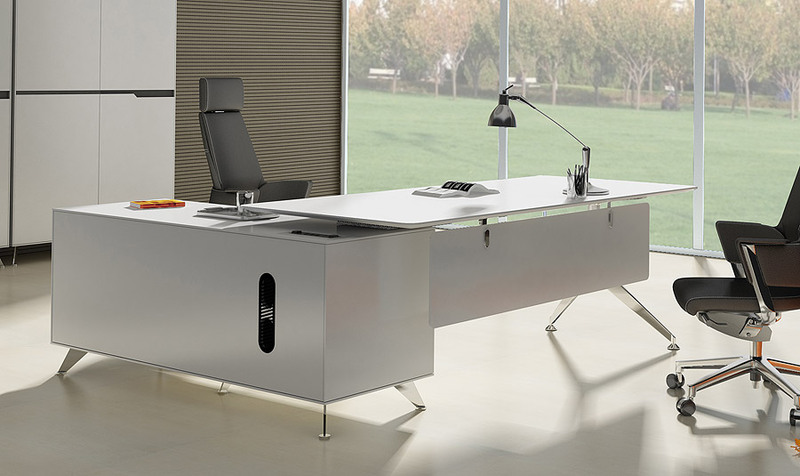 It merges the classic design of an executive desk with your needs as a modern professional. In addition, the Arundel Executive Desk is crafted with fine elegant details and only the highest quality wood veneers, lacquer and steel. 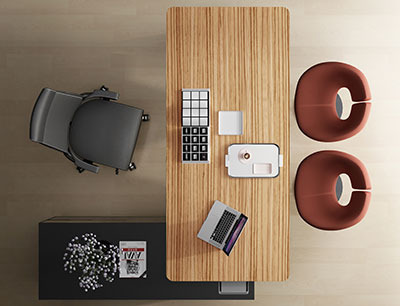 This captivating combination takes any ordinary office space to the next level! 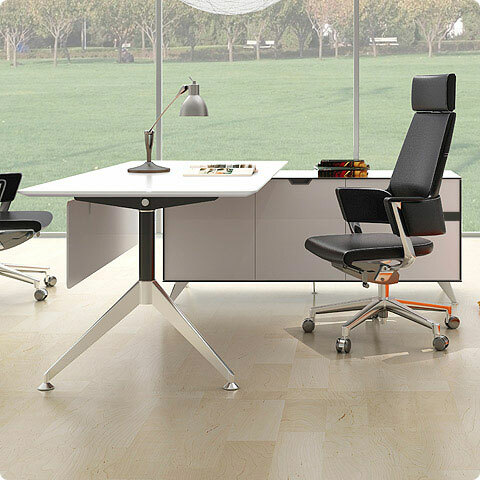 Executive desks can come in a variety of shapes. 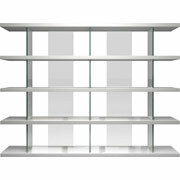 The classic rectangle shape is standard and works well in many office spaces. However, U-shapes and L-shapes also look fantastic in many spaces and they add extra functionality and flair. The Arundel Executive Desk comes in a convenient L-shape. It helps you to access everything you have on your desk without moving your chair around. You'll always have your papers and office supplies at arm's reach. This design also maximizes the amount of desk space you can fit into a smaller area. The Arundel Executive Desk is made for everyone. Left-handed people rejoice - here is one furniture item that's made with your needs in mind! 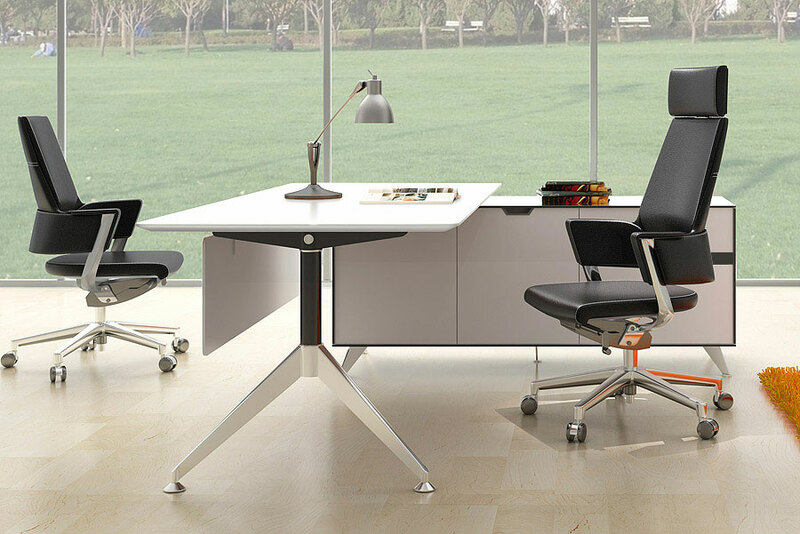 Arundel boasts two configurations to choose from when you buy, often dictated by the layout of your office. Floating your desk in the room? Say 'hello options!' For example, if you're left-handed, choose the left return configuration to optimize your workspace for your own personal needs. If you're right handed, you should choose the right return option. This simply means that the 'storage' side of the desk will be attached to the 'writing' side of the desk on either your left or right. Most of the time you're at your desk, you'll probably be using at least one electronic device. Most likely, you'll be using multiple devices at once! Your computer or monitor, your laptop, your tablet, your smartphone... everything will need to be plugged in. It can be extremely frustrating if your desk is in a place where there are no nearby outlets. With the Arundel Executive Desk, you won't ever have this problem! There is a built-in power station equipped with two power sockets where the return cabinet meets the desk. When you aren't using this power station, it doesn't have to get in your way or become an eyesore. 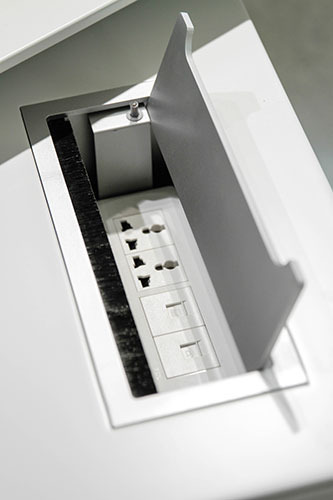 This power module can be seamlessly concealed. On Arundel's main desktop, the writing side, you'll have a simple flat surface with plenty of room to spread out your papers, laptop and work. Because there isn't any storage beneath, you'll have plenty of leg room while you sit in your favorite comfy desk chair like the Benoit Office Chair or the Fifi Swivel Chair. This extra leg room is an added comfort when you have to sit at your desks for long periods of time. This part of the desk 71-inches wide and 35.5-inches deep. Whether you're using a desktop, laptop, paperwork, or a combination of all three, you'll have plenty of room to accomplish your work without feeling cramped. The privacy panel adds some extra seclusion to Arundel, ensuring that you can work in style - even if you're wearing a skirt! On the return side of the L shape, the 'storage' side, you have organization galore! The cabinet is approximately 63-inches wide and 22.5-inches deep, which is plenty of room to securely store all of your office supplies! The space is divided into thirds: two cabinets with one door each, with drawers on the end. Each of the cabinet space has two shelves inside to keep all your office supplies organized. They're great for storing anything, and the corner-most space is even vented! It's perfect to store your CPU inside and manage your electronic wires, all while preventing your computer devices from overheating inside an enclosed space. Arundel's desk with return design ensures that you'll be able to seamlessly alternate between the two sides of the desk and multi-task (if that's your thing!). And Arundel's generous footprint means that collaborating on a project with a coworker or holding a meeting in your office is a cinch - the L-design gives you space to comfortably pull up more chairs. That return also helps you feel like you have your own designated workspace, even if you're in an office with your coworkers. Arundel gives you the perfect blend of expansive workspace without feeling boxed in! A desk can make all the difference for you as you work. You want something that's spacious so you can keep all your work-related items in front of you and easily locate everything you need. In total, the Arundel Executive Desk is a generous 77-inches wide and 73-inches long. Plenty of room for all of your important projects! You'll never have to fit all your work items into a cramped area again. With Arundel's many organizational solutions, your workspace will remain clutter-free, helping you stay relaxed and be more productive while you work. 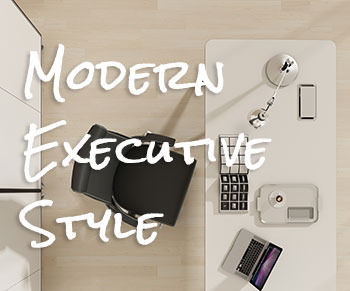 Because this modern executive desk has everything you need, you'll never have to leave your desk. There's a pencil drawer to store your smaller office supplies and a filing drawer to keep all of your papers organized. These drawers smoothly and softly glide open and shut. With 63-inches of length and 22.5-inches of depth, you'll have ample room for a desktop printer or dual monitors. The Arundel Executive Desk comes in both a white and Zebrano finish to perfectly fit the decor in whatever room you have. This modern executive desk is more than just a functional piece. It adds extra style to any space. Some desks are bulky and visually unappealing, but Arundel's stunning shape and materials ensures it's anything but an eyesore. It makes a statement - in a good way! 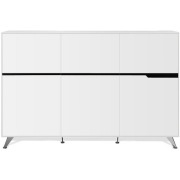 The pure white finish is simple, sleek and modern. It will match the decor of any room you put it in! If you want a crisp, clean look in your room, the white finish is the perfect choice. It's easy on the eyes and fits every style. Which is great if you like to redecorate often. 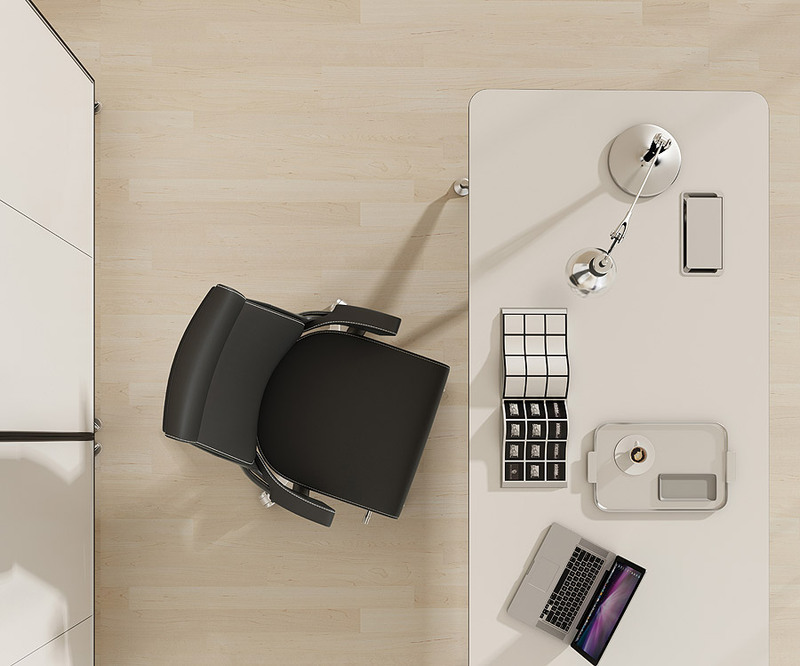 You'll never get tired of the simple and sleek white finish, and your desk will always go with the aesthetic. 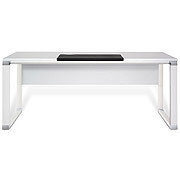 You can either add contrast to a dark room with the white desk, or you can keep the entire space looking light and bright with the gorgeous white Arundel Executive Desk. The bold stripes of the Zebrano veneer finish will make a statement in any room. 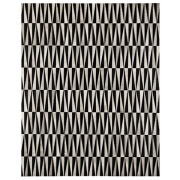 These organic, natural stripes will add a more relaxed and rustic look to your office. This strong, durable wood, also known as Zebrawood, is imported from Africa. The brown finish comes with accents of black to keep it looking fresh and modern. Zebrano is the choice for you if you want to add some warmth to your space. Sometimes offices can feel cold and uninviting - not the type of place you want to be spending your time in. The Zebrano finish is just the opposite! It will make your space feel more welcoming, which will motivate you to work hard. Because the Zebrano finish is darker and more neutral, it's also easier to keep clean than the white finish. The desk stands on chromed steel legs that keep it firmly in place and can support a heavy load of books and desk supplies. The eye-catching, angles metal legs will perfectly accent both the white and Zebrano finishes. The legs make the desk 29-inches high, which is the perfect height to accompany most desk chairs. 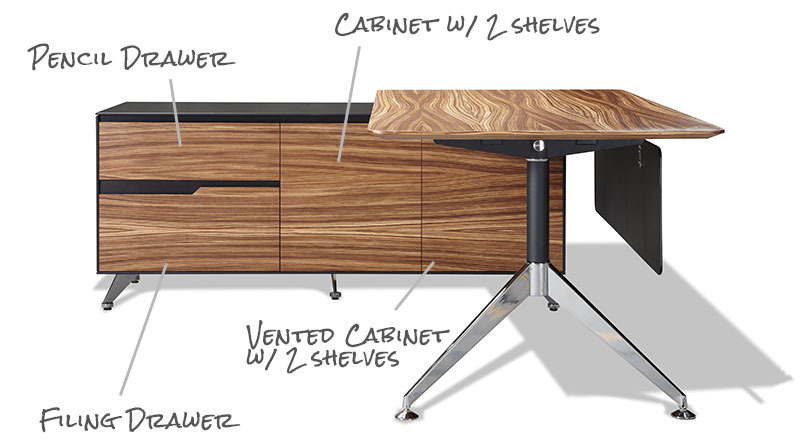 In addition to all of these amazing features, the Arundel Executive Desk is durable. It will be your constant companion through years of hard work, organizing your work space, adding aesthetic appeal, and helping you be more productive. Arundel ships with the cabinet mostly assembled, requiring the installation of the legs, privacy panel and main desktop.